World Toilet Day recognized by UN: US network spreading word. Today – 19 November 2013 – is World Toilet Day. World Toilet Day is being officially recognized by the United Nations this year, and a host of organizations are simultaneously working on sanitation efforts worldwide. Why is World Toilet Day important? 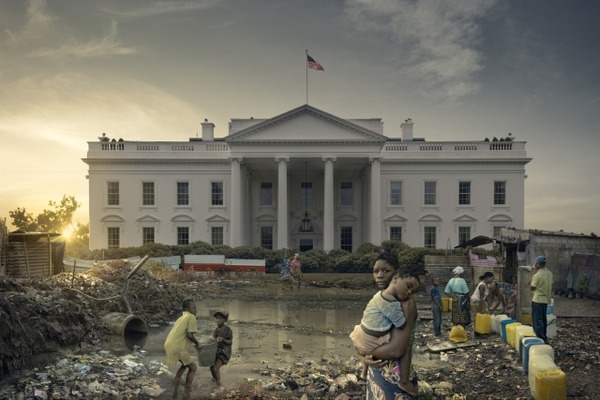 Many people both in the United States and around the world have no safe places “to go.” Sanitation saves lives on a daily basis and in disaster situations, and those most oppressed encounter largest challenges around access. Statistics are stark. 2.5 billion people have no adequate sanitation. Preventable sanitation-related illnesses kill 1.5 million children each year. Around 1.7 million people in the US do not have indoor plumbing. Another 1.5 million people in the US live outside. This is a problem that affects many people in many places. What is the history of World Toilet Day? The amazing Jack Sim, aka Mr. Toilet, started the World Toilet Organization 19 November 2001. He used the acronym WTO (think World Trade Organization) to raise awareness about the lack of sanitation globally. World Toilet Day was inaugurated the year after the anniversary of WTO founding. Starting in 2013, the UN designated 19 November World Toilet Day. Jack Sim is traveling to NYC for a myriad of celebratory events. What can you do? What can you learn? 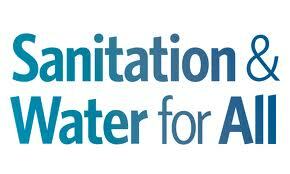 Many admirable organizations are involved in sanitation. PHLUSH compiled a massive list of information and advocacy tools from many of them here. There are UNICEF posters and a Toilet Trek game, an interactive website by WASH United, and much more. Two US grassroots organizations – west-coast PHLUSH and east-coast The POOP Project – are also trying to raise awareness about US toilet issues. See ToiletsUSA : Why We Need to Speak Out on the PHLUSH website. Take The Pooper Pledge on The POOP Project website. Finally, if you are so inclined, you can follow #ToiletsUSA, #WorldToiletDay, #CelebrateTheToilet, #LiftTheLid, or #wecantwait on Twitter. May every day be World Toilet Day. Words aren’t needed when watching this animation convey water justice issues using universal languages of imagery and sound. This animation was created at The Animation Workshop by a group of animators from Bolivia, a French director, music from Bolivia, and others from Mexico and Germany. It features Abuello Grillo (or Grandmother Cricket). Her melodic voice causes the rain to fall filling rivers and feeding crops. One day on a trip away from the countryside, she is kidnapped. Her captors make her sing on stage while they fill water trucks to sell the water to villagers. The ability of a wordless film to tell an intricate story reminds me we can communicate globally without language barriers. This film was able to make me remember many people in the Global South face extremely high water prices when companies purchase and sell municipal water, wonder about the legality of extracting massive amounts of water for bottled water sales, and inquire about the nuances of the definition of human right to water. What does it tell you? The first event I tuned to was the Sanitation and Water for All: Global Decision-makers Unite on WASH talk. Volunteering with PHLUSH, I wanted to get some info on global sanitation initiatives, and I liked the way this group includes sanitation first in their title. The Sanitation and Water for All partnership is over 80 country and organization partners with a goal of universal, sustainable sanitation and water through mutual trust and accountability. They believe in three avenues for action: 1) political prioritization, 2) evidenced based decision-making, and 3) robust planning. They meet alternate years at a High Level Meeting (HLM), and over 400 sanitation and water commitments were made in 2012 with cross-cutting themes of open-defecation, equity, private-sector engagement, and climate change. This talk hosted multiple presenters who work with the partnership. They emphasized the value of monitoring HLM commitments, “a big problem in the sector is monitoring and real-time results related to services.” But each country is responsible for measuring such independently. One presenter, Baker Yiga from ANEW, says countries in his region act on commitments by coordination at the national level, sector working groups, and popularization of commitments with civil servants. Another presenter, Bai Mass Taal from AMCOW, says it’s important to bring sanitation to the highest political level and ensure ministers translate commitments on-the-ground. 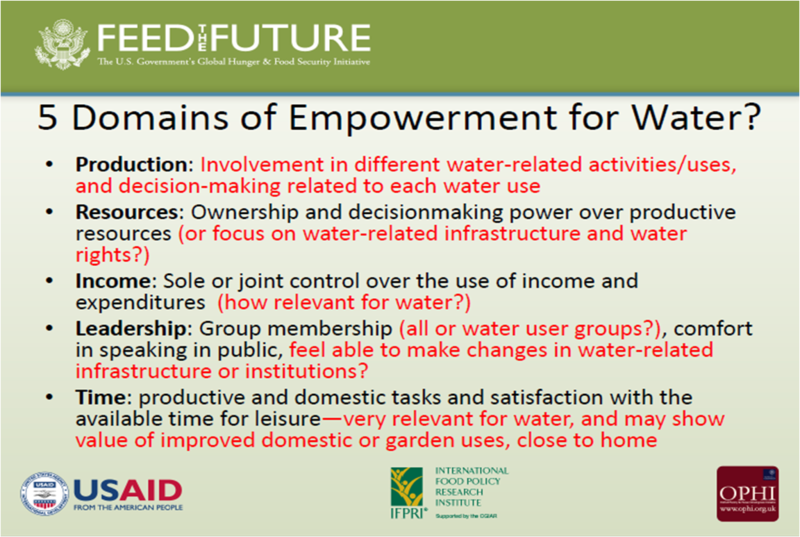 One Twitter comment called for more “tangible examples related to WASH monitoring like Waterpoint Mapping.” For more info on the talk, Twitter comments from this session at #sw4all were compiled into Storify. If you have any updates, send me a message. Greetings from World Water Week in Stockholm via my computer, that is. This week, August 26 to 31, is the highly-regarded water conference held each year by Stockholm International Water Institute (SIWI). This event is a “unique forum for the exchange of views, experiences and practices between the scientific, business, policy and civic communities” in global water and sanitation arenas. This year’s theme is Water and Food Security, and here is some food for thought. Water is used to grow food, land rights often determine who has water access, and water-intensive food diets are becoming more common. With around 850 million people w/o enough food and 780 million w/o safe water, it’s essential people get together to talk water and food. This year’s conference is hosting a number of neat workshops to allow for knowledge sharing. 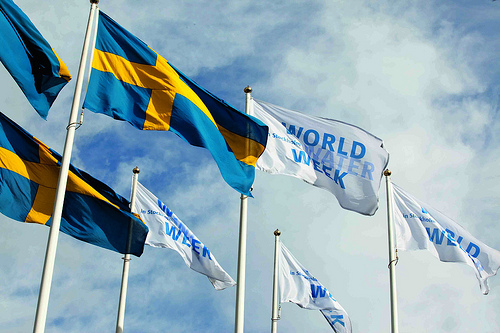 If you’re like me and can’t travel to Stockholm, you might be wondering how to get more info about World Water Week happenings. The SIWI folks have made it pretty easy this year. They created a Social Media Hub with a stream of select conference seminars at www.watermedia.org. They also have a YouTube channel with videos and interviews. I like the inspiring video feature of the WASH Media Award Winners there. In the Twittersphere, they created an event hashtag at #wwweek. You watch the #wwweek chatter on Twitter or online to learn more and meet new people. I created a #wwweek stream on the lower right-hand side of this blog, if you’d like a sneak peek. My experiences attending World Water Week virtually have been pretty awesome so far. I’ve tuned into two talks, and brief summaries will be posted shortly. Hejdå. It always strikes me how a small but creative idea can spread spurring people around it to see the world in a new way. Or its ability to influence individuals to engage in positive change. Word Above the Street is one such idea. Mary Jordan wants to “draw attention to Water as a precious resource by transforming 300 rooftop water tanks in New York City into works of art”. These works of art will focus on bringing awareness to water scarcity and water sanctity around the world. Professional artists, emergent artists, and youth have been asked to submit art ideas for the tanks. Positive effects of this art project will be far-reaching. Over 8.4 million NYC residents, 5 million tourists, and millions of virtual visitors will be able to see the exhibition during the summer of 2012. This may be the first time many of these people have thought about water as an important issue, and this project may inspire others to further create positive change. Right on Word Above the Street! Many around the world have just finished watching the USA vs. Algeria game in South Africa. USA won the match (1-0) and will be able to continue to play in the 2010 World Cup. I’m happy with the final score (sorry, Algeria) but not so happy about something else. During the time of each World Cup match, around 140 children in Africa will die from diarrheal illnesses related to dirty water and a lack of toilets. One organization, Wash-United, hopes people will become more aware of these issues during the 2010 World Cup. They have enlisted football greats like Didier Drogba, Nwankwo Kanu, and Stephen Appiah and created Public Service Announcements (PSAs) to help the spread the world. Enjoy these PSAs as part of the PSA-a-thon Series, and keep watching and rooting for your favorite teams. Can’t get enough? The other five PSAs in the series cover rainwater harvesting in India, the LA Tap Project, a water-conservation campaign in Denver, the Tap Project 2009, and Charity Water. Most people should know the facts: almost 2.6 billion people in the world do not have access to basic sanitation and over 6,000 children die each day from dirty water and poor sanitation. Adequate sanitation, hygiene, and drinking water are essential to keep people healthy. So it’s great to hear via Water Advocates about three innovators taking steps to improve sanitation conditions in Africa. David Kuria, founder of the company Ecotact, builds free-standing bathroom facilities in Kenya. These facilities are compared to malls because they have a place for shoe shines, food vendors, phones, eight toilets, a water kiosk, a baby changing station, and showers. 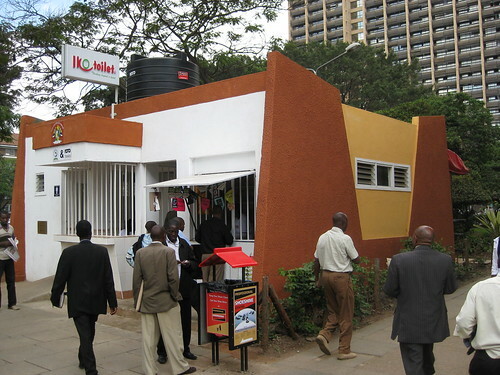 Above Photo: Iko Toilet in Nairobi. Water Advocates. Dr. Joseph Adelegan, of Nigeria, developed a large bio-recator to convert waste from a 1,000-cow slaughterhouse into bio-gas (energy). This bio-gas is sold at reduced prices to the poor and used for cooking or electricity. Plus his business has prevented the slaughterhouse from dumping cow waste into the nearby river that is also used also for cleaning and bathing. 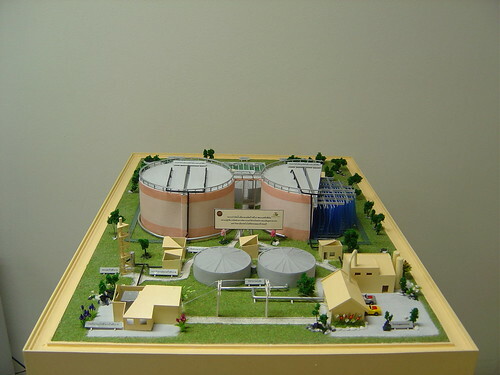 Above Photo: Large-Scale Bio0gas Facility in Africa. Water Advocates. Trevor Mulaudzi started this business in South Africa after “he found children skipping class and defecating in the open because their school’s toilet was piled with feces.” He and his 300 employees clean up and repair previously unusable toilets. 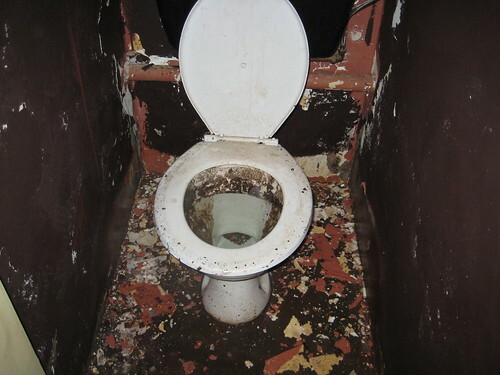 The clean toilets give users a sense of pride about their facilities and encourages them to keep the facilities clean. Above Photo: Dirty Toilet in South African School. Water Advocates.